Vancouver-based 'Technical Luxury™' brand Kit and Ace has confirmed its third Canadian flagship location to be at West Edmonton Mall, after recently confirming two permanent locations in Toronto and Vancouver. The Edmonton store will open early this fall. Kit and Ace plans to open 15 Canadian flagships by early 2016 as it grows its store base worldwide. Founded in 2014 by Shannon Wilson (wife of Lululemon founder Chip Wilson) and her son, J.J., Kit and Ace's clothing is made from proprietary fabric called Qemir, which includes a percentage of cashmere. Remarkably, the product can be washed in a machine instead of having to be dry cleaned. Kit and Ace will replace West Edmonton Mall's Smart Set location on the mall's second level. Spanning about 2,900 square feet, Kit and Ace will be located between Express and the mall's busy Apple Store. Below is a mall map and lease plan showing Kit and Ace's new location. 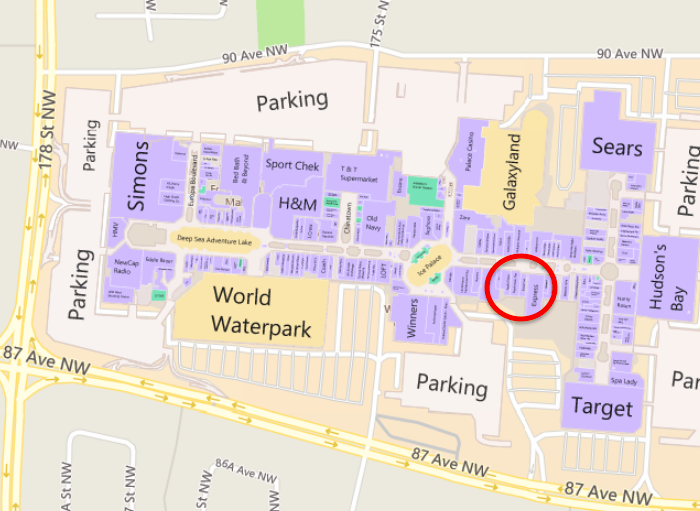 Click image for interactive mall map. Lease plan: West Edmonton Mall, published with permission. A Calgary flagship, located on 17 Avenue S.W., is also expected to be announced shortly. Kit and Ace currently operates five Canadian locations. These were originally intended to act as temporary test 'studios' prior to the brand's long-term rollout. Located in Vancouver, Edmonton, Calgary, Saskatoon and Toronto, all but the Vancouver studio operate on 12-month leases. The brand's first two Canadian flagships are now confirmed. Opening in October, a 3,300 square foot location at Toronto's 102 Bloor Street West will replace a Benetton store as well as an adjacent retail space to the rear facing Critchley Lane. A second Vancouver location will open on July 1, at 2235 West 4 Avenue, in the popular Kitsilano area. Kit and Ace also plans to open at least one more location in Toronto, as well as flagships in Saskatoon, Regina, Winnipeg, Halifax, and possibly eventually Kelowna, BC. Kit and Ace's original 151 Water Street 'studio' will remain open indefinitely, according to co-founder J.J. Wilson. The Vancouver location was the brand's first and it opened in July of 2014. Kit and Ace continues to look for retail space, generally in the 2,800 to 3,200 square foot range. Although streetfront locations are preferable, the brand will consider locating in top-tier high-traffic malls. Besides the approximately 15 Canadian locations intended to open by early next year, Kit and Ace will open a further 15 to 40 locations internationally. Japan, the United Kingdom and Australia are on its radar, with American locations confirmed for Cincinnati, Columbus, Denver, Minneapolis, St. Louis, San Jose and Washington DC -- all scheduled to open by mid-October of this year.